Over 100 secondary schools in England and Wales now regularly use sniffer dogs to deter pupils from using drugs. A survey by the magazine Druglink found dozens more schools are planning to follow suit in the war on drugs. The rise in the use of these animals comes three months after the Department for Education sent schools guidelines on how to tackle drugs. The guidance gives head teachers the right to use sniffer dogs, as well as random drugs testing. But it says schools should use "extreme caution" if they plan to use dogs without police involvement. The guidelines were sent to schools weeks after Prime Minister Tony Blair said the government would give heads new powers for random drug tests. 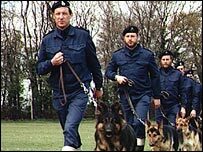 "Sniffer dogs are not over the top," Annette Croft, head teacher of the Heart of England secondary school near Solihull, told Druglink. "They are a very mellow, human and civilised response to the threat of drugs in my school." But this view is not supported by all. Critics says the use of sniffer dogs in schools is designed to created an atmosphere of intimidation and fear. Schools drug advisor for the Wolverhampton area Emma Balchin said she and her colleagues were mistrustful of sniffer dogs, which were fast becoming "an unstoppable force". "It's just a way of schools saying they have a hard line on drug abuse to parents, while driving pupils' problems or concerns further underground. "I felt that no matter what we did to advise against it, it was going to happen." Chris Keates, acting general secretary of the teachers' union, the NASUWT, said: "We support in principle the government's proposals on random drug testing." "However, this must be in the context of tests being conducted by the police with proper regulation and control," she said. "We are extremely concerned about the apparent trend for some schools to use private companies, whether or nor they are using dogs." "The demand to search schools has rocketed"